What role did music play in Soviet society during the eras of Lenin and Stalin (1920s-1950s)? That's the issue examined in the book, "Soviet Music and Society Under Lenin and Stalin: The Baton and the Sickle", edited by Neil Edmunds (Routledge Curzon, 2004. List Price $100). The book examines the various strategies adopted by composers and musicians in their attempts to carve out careers in a rapidly evolving society. It discusses the role of music in Soviet society and people's lives, showing how political ideology proved to be both an inspiration as well as an inhibiting force. The book consists of 11 chapters written by various contributors. Attention is given to music of certain regions, such as Armenia, Karelia (near Finland) and Kazakhstan. Some chapters deal with more general themes such as Russian folk music in the 1930s, or the propagandistic uses of music, particularly in the 1920s. Gerard McBurney, a well-known musicologist and composer who has reconstructed some of Shostakovich's more fragmentary music scores, discusses Shostakovich's works. Prokofiev's ballet "Le Pas d'Acier" is also examined. Only one chapter in the book is dedicated entirely to the life of a single composer. This is the chapter written by Matthew O'Brien about Uzeyir Hajibeyov (1885-1948). Left: Azerbaijani composer Uzeyir Hajibeyov (1884-1948) featured in book entitled "Soviet Music and Society Under Lenin and Stalin: The Baton and the Sickle" by Neil Edmunds. It was early 2002 when O'Brien was first approached to contribute a chapter to this anthology. He initially had planned to write about Nikolai Myaskovsky, a Russian composer whom he feels is very underrated. O'Brien began his research but at some point quite early on, he chanced upon HAJIBEYOV.com, a Web site created by Azerbaijan International magazine which features the life and work of Uzeyir Hajibeyov. 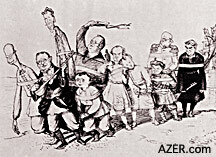 O'Brien ordered Hajibeyov's music (the 6 CD set of Classical Music of Azerbaijan and the 7 CD set of Uzeyir Hajibeyov) at AZER.com. The only work by Hajibeyov that O'Brien had ever heard prior to this was the Soviet Azerbaijan National Anthem, which he had discovered on an old Melodiya LP. There were a number of factors that attracted Matthew to write about Hajibeyov. He explains his decision like this: "First of all, Hajibeyov's music itself is great. I've always been fascinated by the exotic Eastern hints that can be heard in some Russian compositions, but Hajibeyov's music was different. His was a genuine attempt to find a synthesis between eastern and western music. It wasn't just a European composition given some fancy Oriental dressing. Hajibeyov's music was different. Whatever anyone may think about the musical and compositional merits of his first mugham opera, 'Leyli and Majnun', in my opinion, it is one of the most progressive and experimental pieces of music written at that time - more so even than controversial works, such as Stravinsky's 'Rite of Spring." Left: Program from Koroghlu opera performed in Moscow in 1938. But in addition to the music, O'Brien was fascinated by Hajibeyov as a human being. O'Brien writes: "The material posted on the HAJIBEYOV.com Web site enables the reader to 'get to know' the composer in a way which is very rare except for big name composers. However, this information has no ulterior motivation forced upon you as, for example, most literature related to Shostakovich. So for me, another incredibly important factor was the greatness of this man as a human being. "There are many composers whose music I cherish and many whom I wish I could have met, but there are few who can be described as being as great a human being as their music. The testimonies about Uzeyir Hajibeyov all confirm this. His kindness stands out, as does his progressive and liberal attitude towards women (especially for his time and background). His importance is much more than just as a composer." The book will appeal to specialists in Soviet music history, those interested in 20th century music in general, as well as students of the history, culture and politics of the Soviet Union. Below: Azerbaijan's First Orchestra of Traditional instruments with Notes, meaning that prior to this time, these instruments were played exclusively from memory and improvisation. 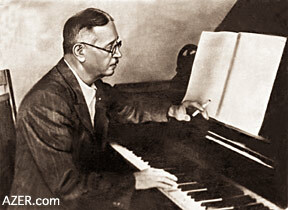 Hajibeyov led the movement to learn to play composed music from reading notes. He is seated in the front row, wearing glasses. Composer Said Rustamov is left of Hajibeyov. 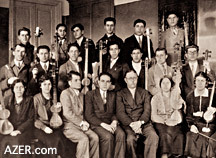 Haji Khanmammadov, the first person to compose concerts for tar, kamancha and harp, is on th second row, third from left. Matt O'Brien lives in Harrogate, North Yorkshire, UK. Researching and writing about Hajibeyov kindled a deep interest and love for Azerbaijani music. Since then, Matt has gone on to compile a "Dictionary of Azerbaijani Composers". Azerbaijan International's staff is assisting O'Brien by meeting with Azerbaijani composers, collecting photos and checking the accuracy of the list and making sure that their newest works are also included. Contact Matthew O'Brien at ai@artnet.net.